CCS communications are likely to play a crucial part in determining what kind of role CCS eventually ends up playing in the energy and climate infrastructures currently being planned and built around the world. With CCS not yet operating on a commercial scale, CCS communications via media coverage, visits to science museums, and especially websites, make up a significant part of the ‘CCS’ that most people will experience. As Hammond and Shackley (2010) point out, the images and presentation of CCS, more than actual CCS infrastructure or experiences with CCS, make up what CCS means to most people at the present time. The importance therefore of questions about how CCS is being communicated becomes imperative, specifically, how such communication is, and may be, developing and where it might be enhanced and improved in the future. This report reviews the scope and key characteristics of carbon dioxide capture and storage (CCS) communications and primarily builds upon a comprehensive Global CCS Communications Database that was compiled for this project. The report also draws upon investigations of non-web sources, including books, articles, media reporting of CCS, educational materials and museum exhibits, to provide as varied and comprehensive an overview as possible of CCS communication practices to date. Overall, progress is slow and sporadic but gradually building in scale and scope. The focus is still on how CCS works, rather than how it might be made to work and the overall benefits. Transport is the ‘invisible’ technology. 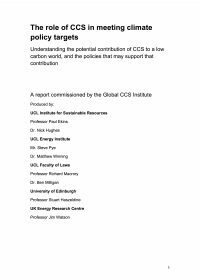 There is a heavy reliance on climate change as the sole rationale justifying CCS. A large majority of CCS communications material is overtly positive. Communications by research institutions are usually narrowly technical, but more critical sources tend to focus on a wider set of issues, especially social concerns. The Internet remains the focus for CCS communication. English remains the primary language of CCS communication. The ‘one-size-fits-all’ approach limits potential usefulness to many groups. Educational materials are being developed but only slowly.